Cars International is putting another stunner on the Maltese roads – the all-new Opel Cascada. The Cascada, Opel’s new all-season convertible, is a classy four-seater with an elongated silhouette and a high-quality soft top. 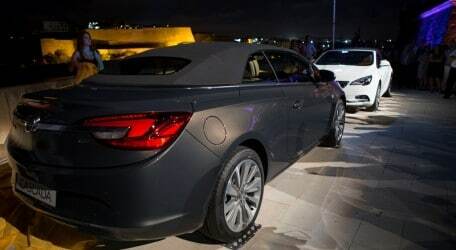 Heading to the top of Opel’s line-up, the Cascada is a midsize convertible not only by its size, but also by its allure and the premium technologies and features it offers. The Cascada provides a sharp driving experience thanks to its super-rigid body, High Performance Strut (HiPerStrut) front suspension and FlexRide adaptive damping system. Its driver and passengers can enjoy the open-air feeling thanks to the premium soft top that can be opened at the touch of a button in 17 seconds while driving at speeds of up to 50 km/h. Electric seat belt presenters, exclusive Nappa leather and ventilated, ergonomic seats as well as invisible, watchful safety systems make life serene and safe. With its broad stance and a flowing continuity of sculptured shapes that is typical for Opel, the Cascada design reflects the classic and timeless elegance of the “Grandes Routières” of a bygone and glamorous age. Top quality materials selected from suppliers of the most prestigious premium cabriolets are used to build Opel Cascada’s soft top. It benefits from superior acoustic and thermal insulation thanks to a special layer of polyester fleece between the outside layer and the interior lining. The Cascada’s cockpit offers a striking, sculptural yet sporty design highlighted by precise, handcrafted details. The lines of the wing-shaped instrument panel, which features real stitching on soft, wrapped surfaces, flow into the doors, dynamically embracing the front-seat occupants. All new richly trimmed seats are offered in several elegantly embossed fabrics and leathers. The up-level AGR certified ergonomic seats are wrapped in rich, soft Nappa leather and benefit from heating and ventilation systems: on hot, sunny days, fresh air is drawn through the holes in the perforated leather to increase front occupants’ comfort. Securing them is easy and comfortable due to the electric seat belt extender which brings the seat belt within close reach using a telescoping arm. An electric Easy Entry system makes access to the rear seat swift and comfortable. The Opel Cascada benefits from great storage and stowage capacity for a convertible, allowing comfortable, all-season daily use. Several useful, large storage spaces have been placed around the driver: in the door, in and under the instrument panel and, thanks to a standard Electric Park Brake, in the centre console – just where you need storage space the most. The minimum load volume with the roof open is 280 litres, and up to 350 litres are available when the soft top is closed. To extend its load volume or transport exceptionally long objects, the Opel Cascada benefits from the FlexFold system that electrically releases and folds down the 50:50 split rear seat back rests – a feature that cannot be offered in hard-top cabriolets. Body stiffness is a key criterion for open-roof vehicles; it has a high impact on their driving behaviour, steering precision, acoustics, safety and comfort and also conveys a clear feeling of their genuine quality. The Opel Cascada provides a superior balance between torsional and bending stiffness thanks to several measures including impressive underbody crossed steel bars and reinforced rocker profiles. FlexRide, Opel’s integrated, fully adaptive chassis control system is of course available in the Cascada. It enhances its ride and handling performance and safety as it adapts to the driving situation, driving style as well as the drivers’ preferences. The Opel Cascada can be equipped with 17” to 20” wheels. Brake discs have sizes of up to 326 mm in front and 325 mm in rear. A broad powertrain line-up will be available in the Opel Cascada convertible. The 1.4 gasoline Turbo opens the portfolio; it is combined with a manual 6-speed transmission and is available in 103 kW/140 hp, both delivering up to 220 Nm thanks to an overboost function. On the diesel side, the 2.0 CDTI with 121 kW/165 hp comes with either a manual or an automatic 6-speed transmission. This engine delivers up to 380 Nm when its overboost is active. The highlight in the Cascada powertrain line-up will be the 1.6 SIDI Turbo ECOTEC gasoline engine. This midsize direct injection unit is part of a fully new generation and is geared to very smooth ride and torque delivery and great fuel economy. It delivers 125 kW/170 hp, between 1,650 and 3,200 rpm – and 280 Nm thanks to an overboost function. This engine will be available with manual 6-speed transmissions. Both the cabrio and cosmo Cascada combine an open-air driving experience with the best of Opel technology. This includes the AFL+ Adaptive Forward Lighting system with up to 11 automatic functions, the second generation Opel Eye front camera with its new, extended functionalities (enhanced Traffic Sign Recognition and Lane Departure Warning, new Following Distance Indication and Forward Collision Alert), a rear-view camera and an Advanced Park Assist that eases parking manoeuvers, an ultra-sonic based Side Blind Spot Alert, ergonomic front seats, a heated steering wheel, and Hill Start Assist. Opel’s new-generation IntelliLink system, with state-of-the-art infotainment technology including fast, user-friendly navigation and voice control, now arrives in the Cascada’s cockpit. Easy operation is guaranteed via a seven-inch, high-resolution colour monitor which can also display images from an optional rear-view camera. The system features Bluetooth phone connectivity and audio streaming, while the top-of-the-line Navi 950 IntelliLink provides maps covering the whole of Europe, with updates downloadable via USB. The driver can also, for example, configure the system to read out incoming text messages. In addition to voice control, IntelliLink also supports and integrates the voice recognition functions of smartphones. The Cascada’s extremely rigid passenger cell is mainly fabricated from high-strength steel for the least deformation and largest possible survival space in crash conditions. Doors have diagonally mounted ultra-high strength steel beams and beltline reinforcements. The A-pillars supporting the windscreen are in press hardened steel. In case of roll-over, pyrotechnically activated spring-loaded high-strength bars automatically deploy behind the rear seats. These pop-ups are also triggered during other severe impacts – when airbags are deployed – in order to prepare the vehicle for possible secondary impacts and resulting roll-over. Front seats both benefit from two-way active headrests and double seat belt pre-tensioners and even the two rear seats have seat belt pre-tensioners.